Pink milkweed is an erect, herbaceous perennial wildflower. Its showy pink flowers are slightly fragrant. They are born in compact terminal or axillary umbels. Individual flowers have reflexed corollas and an upright corona — a characteristic typical of milkweed flowers. Leaves are long (up to 6 inches), elliptic to lanceolate, and glabrous. They are oppositely arranged. Stems are stout, glabrous and multi-branched. Seeds are flat and brown with silky white hairs attached. They are born in pods, which split open when ripe. Seeds are dispersed when their silky hairs catch the wind. 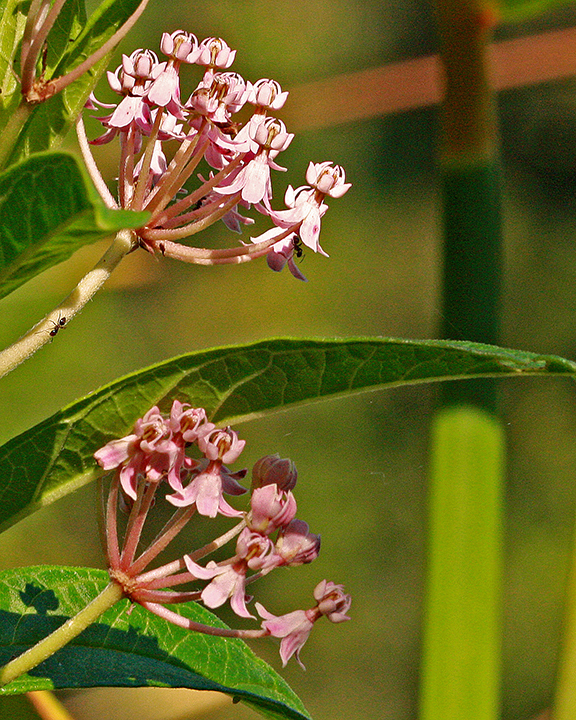 Pink milkweed occurs naturally in floodplain swamps, hydric hammocks, wet pine flatwoods and marshes. It typically blooms in summer and attracts many pollinators. It is a larval host plant for monarch, queen and soldier butterfly caterpillars. The genus Asclepias is named for Asclepius, the Greek god of healing. To see where natural populations of swamp milkweed have been vouchered, visit www.florida.plantatlas.usf.edu. Garden tips: Pink milkweed is one of the most striking native milkweeds. It makes an excellent addition to moist, sunny landscapes, but can tolerate occasional drought once established. Caution: All milkweeds contain a toxic latex sap that may irritate skin. Pink milkweed is available from nurseries specializing in Florida native plants. Visit www.plantrealflorida.org to find a grower in your area.